Documenting Dissent is a rich resource to help bring local history to life in the classroom. These Teachers’ Notes highlight some of the ways that Documenting Dissent materials can be used to learn about the First World War at Key Stages 2 and 3 and think about the relevance of that conflict for young people today. The activities are relevant to a variety of subjects including History, Citizenship, PSHE, English and Art. It is anticipated that teachers will adapt these ideas to the particular needs and abilities of their pupils. You can also download these notes as a PDF. Pull-up displays are available to borrow from Global Link. Global Link has pull-up displays on conscientious objectors and women in World War 1, as well as other resources that schools can borrow. We also run workshops for primary and secondary pupils and training for teachers. See below for ways young people can engage with Documenting Dissent materials to learn about World War 1. These Teachers’ Notes are also downloadable here. Because of the high number of casualties during the First World War, conscription was introduced for the first time in the UK in January 1916 via the Military Service Act. 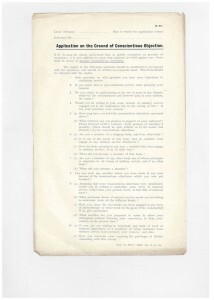 The Act included a ‘conscience clause,’ which allowed exemption from conscription, the first time conscientious objection was established in law anywhere in the world. However, the implementation of the conscience clause proved problematic. Read the Documenting Dissent introduction on conscientious objectors (COs) or borrow Global Link’s set of three pull-up displays and discuss: Why might men in 1916 have objected to fighting in the war? What options did they face? How might others in their family and community have reacted? How easy or difficult do you imagine it might have been to be a CO during World War 1? Read the articles about the brothers, Alwyne Walmesley and Cyril Walmesley, from Lancaster who took two very different approaches in their objection to fighting in the war. Role-play a conversation between the brothers about the different choices they made and their contrasting attitudes to conscientious objection. Read the article about Albert Tomlinson and the letter that project volunteer, Bella Quinn, wrote to him one hundred years later. Write a letter in a similar style to another of the COs featured on Documenting Dissent. Alternatively, write a letter from one of the COs to their family member or friend, explaining their decision. 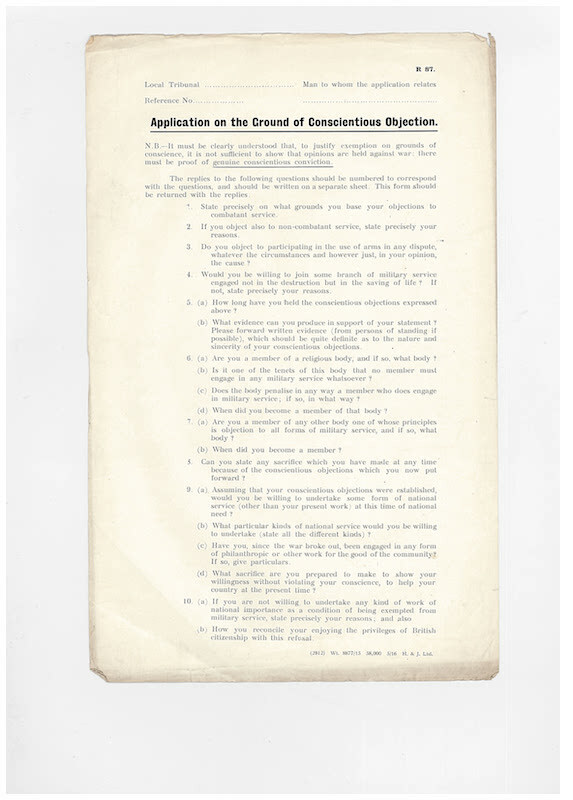 Notice listing questions to be asked of those applying for conscientious objection at tribunal in World War 1. Look at this WW1 poster about COs ‘This little pig stayed at home,‘ and analyse the way that COs are portrayed through the use of words and visual imagery: What attitude towards COs does this poster present? Why do you think such posters were produced? For more activities on WW1 CO propaganda posters, see the British Library teaching resource, Pacifism and Conscientious Objectors). The Order of the White Feather was founded in 1914 by Admiral Charles Fitzgerald, encouraging women to hand out white feathers – a symbol of cowardice – to men who did not join the army. Take a look at this letter sent with a white feather to a man during World War 1, held in the Imperial War Museums Collection (print it out and look at copies of it in groups alongside a real white feather.) Thought-tunnel or mind-map how it might have felt to receive a white feather and a note like this. Create a collage using white feathers, along with other images and words, that shows your response to what you have learned about the experiences of conscientious objectors and the attitudes of the time. The First World War caused a huge refugee crisis across Europe but it is perhaps not very well known that up to 250,000 Belgian refugees escaped to the UK, the largest single influx in British history. Courtesy of Lancashire County Council Red Rose Collections. Read the article ‘Belgian Refugees in Lancaster in World War 1’ and Irma Daem’s article, ‘Our Flight to England.’ Discuss Irma’s experience of fleeing Belgium in 1914: Why did she and her family have to leave Antwerp? How must Irma have felt during this time? What are her views on England and her homeland? Look at educational resources that explore the experiences of modern-day child refugees fleeing the conflict in Syria, such as those produced by Unicef, Oxfam and Action Aid. (See also the Global Learning London pamphlet for useful background information on refugees.) What comparisons can be made between Irma’s story and those of current child refugees? Research further into the experiences of Belgian refugees (look at the BBC and British Library resources) and write a poem or diary entry in Irma’s voice describing her thoughts and feelings on having to leave her home and her hopes for the future. Organise a class fundraising campaign for child refugees to support the work of charities such as Save the Children. Oxfam: Syria: A Children’s Crisis? The First World War created conditions for change in the lives of women and girls and many found work and opportunities that had previously been denied to them. 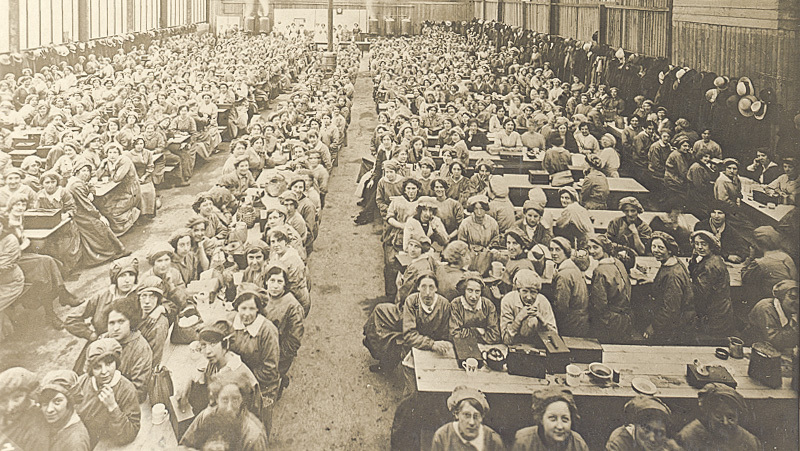 Women munitions workers in the canteen of the National Projectile Factory, Lancaster. Read the article Munitions factories in Lancaster and Morecambe and take a look at the resources about munitions workers on the Imperial War Museums website, including a short recorded interview with Isabella Clarke, who worked at the Morecambe factory during World War 1. Using these sources, discuss: what were conditions like for the women who worked in the munitions factories? What positive benefits may there also have been for women who worked at the factories? 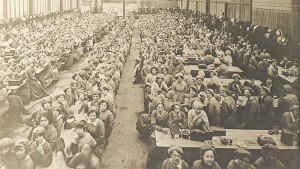 Imagine you are a young woman who has been sent to Lancaster or Morecambe to work at one of the munitions factories. Write a postcard home to your family describing your first week at work. 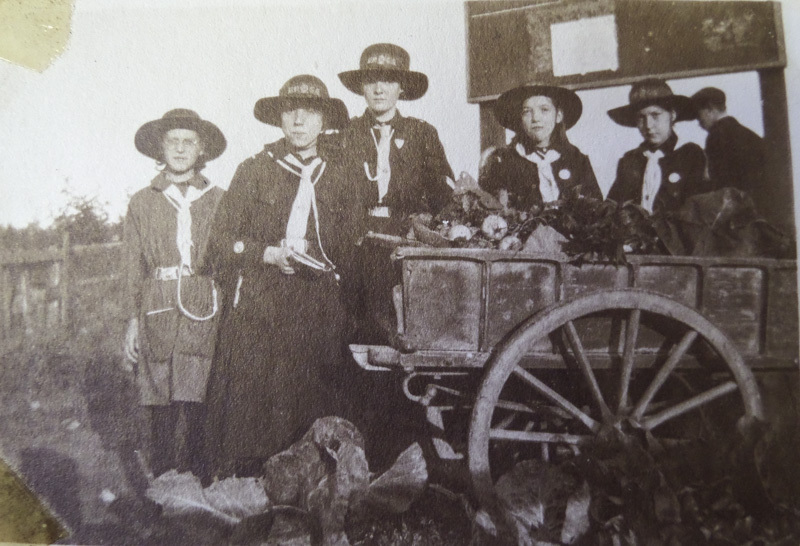 Read the articles Girl Guides in Westmorland in World War One and How did Lancaster Girls’ Grammar School respond to the war effort during World War 1? List the activities that girls did to support the war effort. Do any of these activities surprise you? 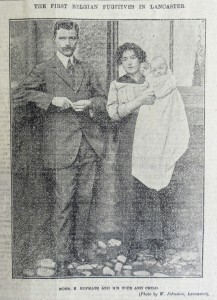 From reading these articles as well as Belgian Refugees in Lancaster in World War 1 and the account by Anne Spencer of the explosion at the Morecambe munitions factory, discuss how the war impacted on life at home for young people. Take a look at some of the propaganda posters featured in this British Library article and educational resource. Looking closely at the language and visual imagery used in these posters, what can you say about the role that women and children were encouraged to play during the war? How were the roles available to women and girls different from today? Design your own poster either encouraging women to work in the munitions factories or recruiting girls to join the Guides during World War 1. Children and young people were encouraged to get behind various campaigns during World War 1 such as collecting waste paper, fundraising for refugees and ‘sponsoring’ prisoners of war. What campaigns would you like your school to support today? Do some research to find out about organisations that work on issues that are important to you and use your school council meetings to discuss what charities or issues you think the school should support and why. Set up a class team to get your chosen campaign going, including creating posters and leaflets. 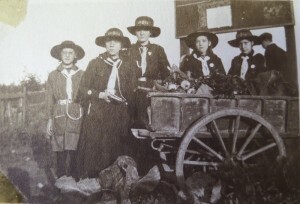 Following the outbreak of war, many women from the North West became involved in the peace movement, often building on the experience and networks established by the pre-war women’s suffrage campaigns. 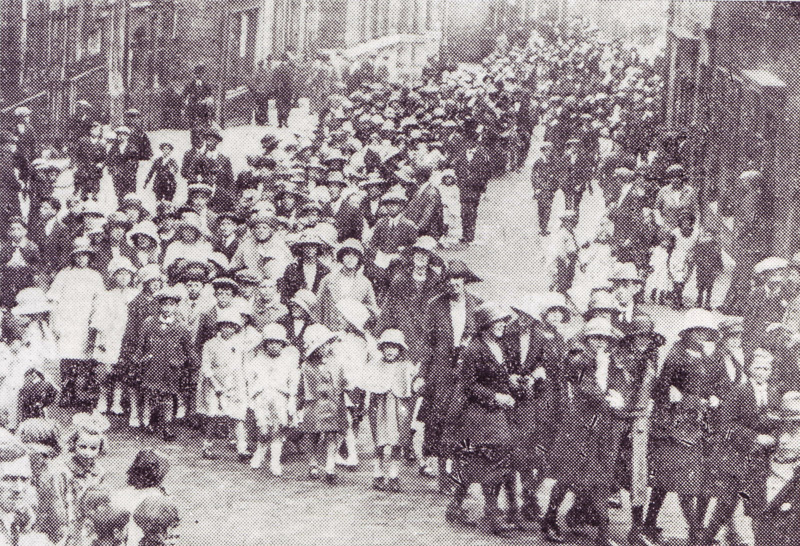 By 1917 the Women’s Peace Crusade movement was taking hold across the region with groups from Carlisle to Blackpool holding meetings and demonstrations. In the years following the war there was a surge in peace activism and women continued to play a prominent part in this. Read the Documenting Dissent introduction to women’s activism and the article about Muriel Dowbiggin, a peace campaigner from Lancaster, and discuss: what do you think might be the reasons women became so involved in peace activism, including taking on leading roles in various peace organisations, during World War 1? What resistance do you think they faced? Do you think attitudes towards peace and towards women as peace campaigners might have changed after the war? Public speaking classes were set up in Lancashire during World War 1 to train women as peace campaigners. Take a look at some of the quotations (particularly the wartime ones) from the Women in World History website and try out some of the discussion and role-playing activities. Watch and discuss Malala Yousafzi’s 2013 speech to the UN about children’s education. Choose an issue that is important to you and write a short 2-3 minute speech that aims to change people’s attitude on the issue. Take a look at the Key Stage 3 resource produced by Global Link for the charity, Children in Crisis, about Conflict and Peacebuilding in Liberia. This resource tells the story of Leymah Gbowee who founded the Women in Peacebuilding Network in Liberia. In 2011 Leymah was awarded the Nobel Peace Prize for the work of her organisation in moving forward the peace talks that ended almost 14 years of civil war in Liberia.